We are all familiar with the force fields that are used in science fiction movies. Most often, they are used to deflect bullets, keep proton torpedoes at bay, and generally ward off alien invaders. Now, scientists have developed a new kind of force field. Unlike the things that we see in movies and on television, this force field is located in (of all places) an umbrella. A team of designers in China have been working for over two years with postgraduate students at the Nanjing University of Aeronautics and Astronautics to invent a new type of umbrella that works without flimsy metal poles. They also wanted to do away with the sheer canopy that is a staple of every umbrella. In fact, the only thing that this device needs is air. It is believed that this device will keep people from worrying about their umbrella breaking or turning inside out in the wind. Early trials have proved to be successful. This new umbrella keeps you dry by creating a ‘force field’ of air that circulates around you. 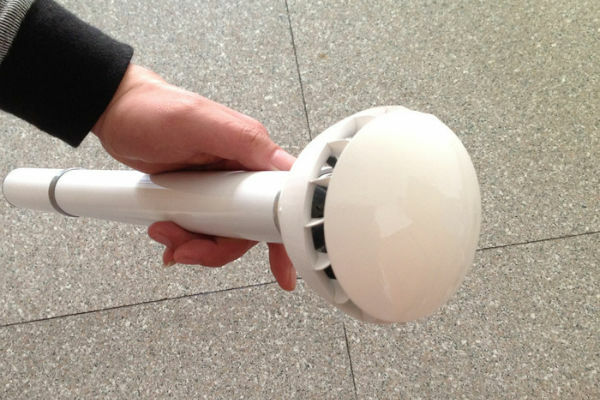 It is known as the “Air Umbrella.” It contains a lithium battery, a motor, and a fan. These work together to create a continuous cycle of air that flows out from the tip. This air flow is strong enough to constantly deflect rain particles away from the user, and the team says that two people can fit under it comfortably. Worried about the size or battery life? The team is developing three models to take to market, with varying coverage space and battery life. Their smallest model will have a 30-centimeter-long handle (just under 12 inches), and it will have a battery life of about 15-minutes. Another one will have a 50-centimeter-long handle (19 inches) and a 30-minute battery life, while the third option will be extendable from 50 centimeters to 80 centimeters and have a 30-minute battery life. They’re working on extending the battery life of all models. At present time, it takes about half an hour to charge. The team also added material to reduce the amount of sound and keep noise at a minimum. For now, the Kickstarter has earned the team nearly 70,ooo dollars (they were originally seeking 10K). The project runs until October 24th and they plan to start delivering their products to backers around December 2015. If you are interested in getting one, check out the Kickstarter page, where they offer more details on the mechanics and have a number of FAQs listed. Keep in mind, it will only work up to a certain wind speed. If gales get too strong, they will over power the umbrella (but that’s what happens now anyways). Still, maybe keep the old umbrella around for a bit, just in case you need a backup.